Preheat oven to 177°C / 350°F. Prepare brownie: whisk together flour and salt. In a sauce pan melt the baking chocolate, and stir in the butter until smooth. Remove from heat, stir in sugar and vanilla. Beat in eggs until just combined. Stir in flour mixture, then spread into prepared pan. Prepare topping: beat cream cheese. Add the eggs, icing sugar, and vanilla. 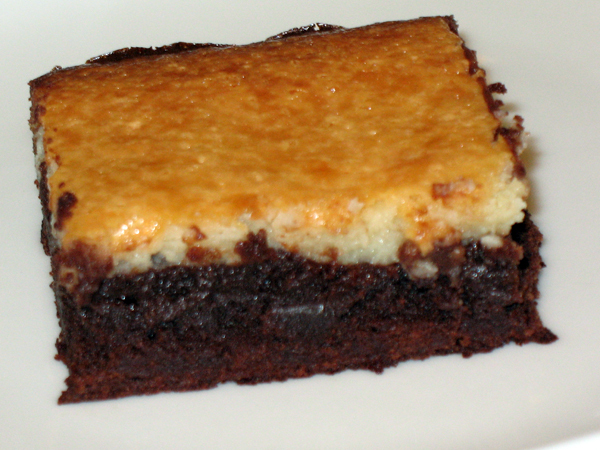 Use metal spatula to spread topping gently over the brownie. Bake 50 minutes, a toothpick inserted will come out cleanly when done. Cool completely in pan, on wire rack. Use tinfoil to lift brownie from pan. Slice lengthwise into 6 strips, then cut each strip crosswise into 6 pieces.